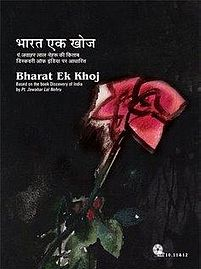 Episode #26 of Hindi TV Serial Bharat Ek Khoj is titled as Synthesis (Hindi: समन्वय). As there were many invaders came to India with different aims. Some of them were interested only in looting this golden sparrow and others have decided to remain in India (that is Bharat) and eventually made it their motherland. As happens in any battle, some of the invaders often need to keep some of their troops and officers to the land in order to keep it under their ruling and manage it. All these actions lead to a scenario where people following different ways of living strat living together. And it leads to influence each other with their own culture, tradition and other aspects through their way of living. And that is how the synthesis happens. The narrator (Pt. Nehru) talks about the Turk-Afghan invaders and the after-effects of their regular attack on Indian soil. While they are mesmerised by the way of living of the people of Bharat, especially their way of worshiping many gods and believing in the non-rigid definition of the God. As per the Bharatiya way of living, there can be many ways to pray to God and none of the ways is considered as wrong. The invaders who believed in the single God, on the other hand, had influenced Bharatiya people with that philosophy as well. The synthesis is clearly seen in Bhajans, Sufi poems and songs and other aspects which are more or less associated with religion in one way or the other. We are then presented with the brilliantly sung and executed “मैं अंधले की टेक तेरा नाम” bhajan by Saint Namdev who is considered as one of most influencing fellow from the Bhakti age. The episode also refers Amir Khushro, Khwaja Moinuddin Chisti, and other well known Sufi poets, whose work is appreciated even till today, without any gender or religious discrimination. The episode also explores the tale of princess Chanda. Chanda was a princess who was married to Vaman. Due to various reasons, their union didn’t work and Chanda was staying back to his father’s palace. The tale of Chanda, sung by a wandering singer irks King Rupchand and he calls the singer in to tell him all about Chanda. Eventually, Chanda and Lorik (a brave warrior) fall in for each other, despite knowing the fact that Lorik is married! Their tragic love story is full of ups and downs and is explored in the episode in detail. The episode then talks about poet Ramanand and his more famous disciple, Kabir. Kabir’s hard-hitting and straightforward lines are still sung with respect by many in India. Kabir declared himself as neither a Hindu nor a Muslim fellow, and he is admired for many of his works. All these incidents are beautifully weaved and are better to watch on screen. The episode is made available to watch for free on YouTube by Public Resource Organization, however I would suggest you to buy a DVD Set instead. For all the content driven media, the real hero always remains the script and this episode of Bharat Ek Khoj is no exception to that. Shama Zaldi and Sunil Shanbag require a special mention for the script they’ve prepared. Actually, this episode is little different in a sense that various incidents, people and places need to be weaved in a way that it can explore the spirit of Synthesis effectively. It is a tough task and it required a remarkable amount of research. We are happy to take note of the brilliance in the script. The credit for the same also goes to the producer and director Shyam Benegal. Being a talented film maker he knows the amount of research work and budget required for the same. And then, he executed the script so effectively that the episode never bores you. TV and Cinema are visual mediums and thus the influence of the actors portraying various roles on the viewers is inevitable. The casting director’s job is thus very tough. Often they are not given the rightful due credit to them, but choosing right actor for right role is not less challenging work. So, whenever we love specific performance(s) by a specific actor(s) we need to appreciate the vision of the makers and casting director both. Pankaj Berry is a fantastic actor and he had proven his metal in many roles. He does the same here again. Here is a brief list of actors with their roles: Aparajita as Krishna, Lubna Siddiqi as Chanda, Murlidhar as Bajur, Mahendra Raghuvanshi as Bantha, Alopi Verma as Roopchand, Amrik Gill as Mehar, Ashutosh Pathak as Vaman, and Poonam Jha as Brahaspati. All of them tried hard to justify respective character they are playing, however not all they are at their best. The performance, on average, is really worth to take a note of. The songs which come at various interval throughout the episode are definitely one of the most important aspects of the same. They are sung quite effectively by Kuldip Singh, Murlidhar, Jasvinder Singh, and Ratan Sharma. Kuldeep Singh composed them very well. The wardrobe requires a special mention. As it is not easy to recreate the dressing, ornaments and other stuff which reflect that era and including multiple cultures and religions together. The research work done here is remarkable as well. The dialogs are simple and effective. You can clearly see diferrent tones based on the culture it reflect and even in the narration. In short it is a nice episode exploring the essence of how the cultures influenced each other and finally adapted into each other in a way that it is reflected in India these days. This episode also proves that if you have good talents at your hand, the budget is nothing more than a figure.